The blata pocket bikes are cherished by minibike lovers. If you love the Blata pocketbikes, like many racers, you probably have your favorite, depending on whether you're looking for speed, power or simply want an inexpensive mode of transportation. Of course, most racers want the first two; speed and power, but control and handling play an important role in choosing one of the Blata pocket bikes as a favorite. Many racers like the Blata Origami B1 for their choice since it offers the latest in the line of technology. However, the Blata Elite 14 is also an extremely popular bike. The hand-built engine completely built by the Blata team of racing engineers, offers the rider 16.2 horsepower besides 7 pound per foot torque and allows the rider to go up to speeds of 75 mph on the straights. It packs more power than many of the heavier and larger 50cc engines even though its only 39.8cc. Of course, the Dell'Orto carburetor is part of the reason for the power. The aerodynamics of the bike from the fiberglass body panels is another reason many racers make the Origami B1, their selection as the most coveted of the Blata pocket bikes. It's also far more comfortable on longer rides because the frame is larger. The Blata Elite series bikes are extremely popular among racers also. Blata offers a variety of bikes in this series and all of them have the eye appeal of any of the Blata pocket bikes. The company bases the development on the race engineering of larger bikes and custom builds these bikes at the factory. The Elite 14 has a reputation of being one of the higher performing pocket bikes. It also has the same engine type as the Origami 1, to keep the bike light and competitive, yet produce the same high speeds that make the wind bite your face. Why would i want a BLATA ? They look good and are speedy and handle well, but besides that they are compact and can be stored easily in the back of a car. Some blata bikes look superb when the graphics are applied to the bodywork and get admiring glances from other pocket bike enthusiasts. As with anything, ensure your bike is well looked after and not ridden too hard, as you’ll be spending too much time at your blata stockist buying spares. Blata pocket rockets are quality and fun combined. 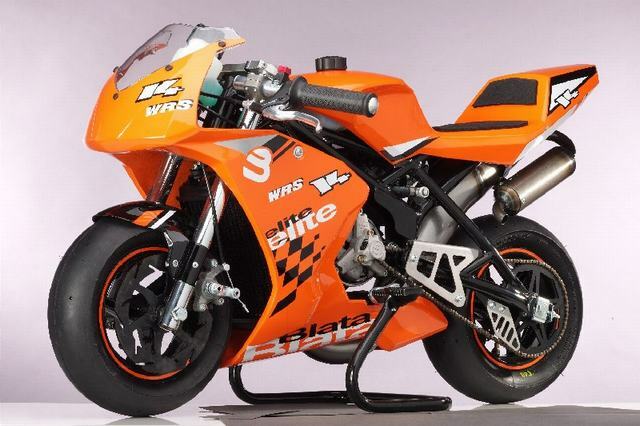 The Blata Honda Repsol 4.2HP- an awesome looking mini-moto machine, with great graphics. Then the Blata Ninja 3.4HP, mean and moody for the race fan, plus the Blata KTM 3.4HP which is advertised as a Mini Motard, which should suit a little bit of rougher terrain, and finally the Blata Midi Quadards, four wheels of stability for your child. All should be of reasonable quality, but remember for used buys you can’t guarantee anything. We have seen a review of the Blata Midi Quadard, which didn’t impress the rider. A cheap clutch and rust issues were apparent. But it’s hard for us to decipher if this was a new or used buy. A looked-after ride is what you need, no matter what the model or cc of engine. 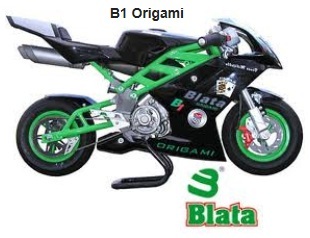 Another choice is the Blata Origami Minimoto (Replica), they certainly look the part and are very cheap. Have a 2-stroke single cylinder engine , disk brakes, electronic ignition and performance exhaust. This is a liquid cooled 39cc bike, & comes complete with alloy wheels and tubeless tyres. So all any biker could want - but remember they are cheap. 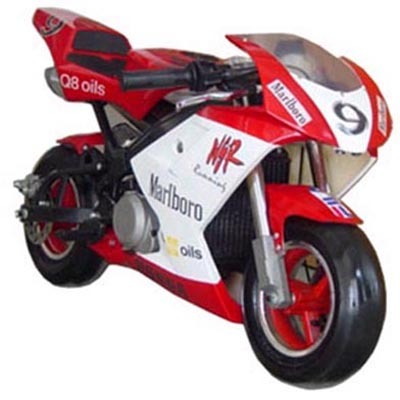 So do be careful of used models - hard ridden blata pocket bikes could be dangerous or ON the flip side - you'll spend more than the bikes worth to get it back on the track! Important point - even if you buy quality blata pocket bikes, they travel at 30mph, faster in many cases. So a helmet and protective clothing is a must - they are deceptive and riders get sucked into thinking they are toys. Until you hit something AT SPEED ...that is. So get geared up, and have fun - be aware to, riding on sidewalks and car parks might not get you into the local police's good books so get down to designated parks ONLY to test your skills. You need to really check your pocket bike engines after races or a fun day out. 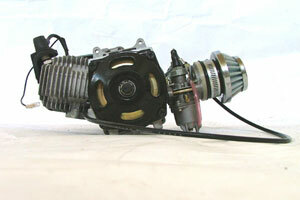 Pocket bike performance parts (and regular parts) - can be expensive and can add costs to your pocket rocket bike. So keep it well maintained with spares and lubricants. Sure - mini engines are cheaper than the bigger alternatives, but no sense in adding costs to your bike, if it’s easily given a once over after a days racing.